There was a time when Persephone Alcmedi thought her life was hard to manage, what with wondering how to make sure she took adequate care of both her grandmother and her foster daughter, Beverley, whether she'd end up in the unwanted position of high priestess of a coven, and whether her waerewolf lover, Johnny, would resist the groupies who hang around his band Lycanthropia. But that was before the fairies started demanding that Seph's frightening, unpredictable ally--the ancient vampire Menessos--be destroyed... or the world will suffer. Seph and Menessos are magically bonded, but that's a secret she dares not reveal to her fellow witches lest they be forced to reject her and forbid her use of magic. And, despite the strain this casts on her relationship with Johnny, as a showdown with the fairies nears, she and Menessos badly need the waerewolves as allies. Life, death, and love are all on the line, but when destiny is calling, it doesn't help to turn away. With the individual threads of their fates twisted inextricably together, can Seph, Johnny, and Menessos keep the world safe from fairy vengeance? 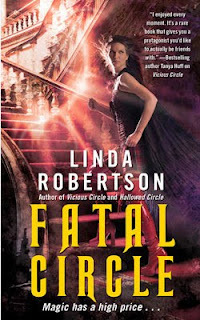 Fatal Circle is the third book in the Persephone Alcmedi universe, and moves forward in solidifying the roles of the main characters. Ms. Robertson balances a delicious love triangle with all of the conflict and action that fans expect in this heroine's life. Fatal Circle is well written, fast moving, and fueled by a mix of romance and paranormal influence. A must read in the Persephone Alcmedi series!